Yep, FaerieCon is this weekend. I’m finished with my creations for Day Fae on Friday and Saturday. I have a few things to tack on to my garments for Good Faerie Ball on Friday and Bad Faerie Ball on Saturday. I promise to post pics of the finished product. Above is my inspiration for Bad Faerie Ball. I made a solid color jacket rather than tie dye. I’m wearing black underneath it with high buckled boots. It looks kind of “matrix-ey” and I’m excited to wear it. I didn’t make any faerie wings to go with this. This is the most literal thing I created. I duplicated the dress above down to the belt and metal tassels. The only thing I modified is the color. The bodice is dark purple and the skirt is dark blue. It’s pretty and flows nicely as I walk. No faerie wings for this one either. 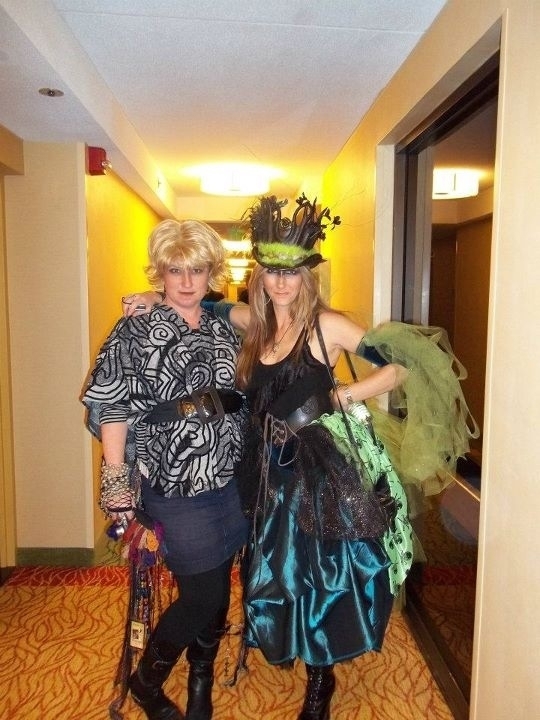 This is inspiration too…last year’s Bad Faerie Ball. Me in a blonde flip wig and Val in her leather top hat. I’m definitely not sold on me as a blonde. But the costumes are scrumptious! I’ll do my best to capture photos of my dresses and all the crazy “goings on” in the Realm.